The False aralia plant also known as “Aralia Elegantissima” or “Schefflera Elegantissima” is a good choice when seeking an unusual tropical effect. Common house plant pests attacking false aralia include spider mites, scale and mealybug. With these pests, contact your local garden center for available products – we like Neem oil for plants. Remember to read the label first. We’ve covered Aralias in the past. We’re going to revisit them again and focus on one variety in particular. This plant has been around for many years but still remains underused in the industry. Dizygotheca elegantissima is more commonly referred to as false aralia or the spider aralia. The name is pronounced DIZZY-GOTH-ICK-UH. It is native to the New Hebrides, an area just north of New Zealand in the South Pacific. There you may find specimens over 20 feet tall. It is a member of the Araliaceae (aralia family) and although it can be propagated from cuttings and air-layering it is most commonly grown from seed. The false aralia has many uses. As seedlings, it is used in dish gardens and in terrariums. When used in this fashion, you usually find it planted in a clump of seedlings and reaching a height of 3 inches tall. 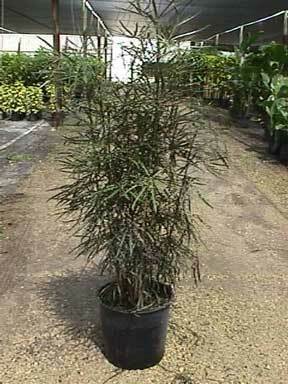 Indoors we find elegantissima as a short, finely textured, bush-type plant in 6 to 10-inch pots. 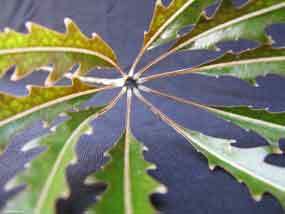 The dark greenish-brown leaves have saw-toothed edges. Plants have little branching and are usually planted as multiple plants. Aralias in general are an especially good choice when you are seeking an unusual tropical effect. We see 14-inch and larger sizes in attractive decorative pottery used as free standing specimen plants with heights of 10 feet to 12 feet tall. An interesting feature of elegantissima is its two types of foliage – juvenile and mature. Typically, you will find the juvenile foliage on plants in 14-inch and smaller containers. Larger plants in 14-inch and most 17-inch and larger containers have leaves that are more mature. They are larger, longer, broader, lobed and more leathery. As the plant matures the trunk will become woody and have a larger caliper. It is not unusual for older, more mature plants have both immature and mature foliage at the same time. False aralia likes warmer temperatures of 60 to 70 degrees and above. The plant can drop some of its lower leaves if the temperature falls below the 60 degree mark. Place the plant in bright filtered light near a sunny window and/or under artificial light with a minimum of 150 footcandles. Moving these plants, to new locations can cause them to drop leaves (usually the older, lower ones of the plant) just like Ficus trees. In terms of humidity, the plant likes as much humidity as possible. It does, however, successfully tolerate low-humidity conditions commonly found in many indoor environments. When watering this plant, as with many indoor plants, water thoroughly, and then allow approximately one-half of the soil to dry out. If you have trouble in watering indoor plants try sub-irrigation. Unlike most plants, though, false aralia sheds leaves when faced with either watering extreme – too much or too little – is followed. Dizygotheca will also drop leaves when the temperature is too cold, the humidity is too low, and when there is excess salts. However you use this plant, false aralia is another great option to create an unusual tropical look.